The Malampaya Foundation, Inc. (MFI) made a donation to the victims of the recent flooding in Metro Manila and Central Luzon, giving a total of Php 2 million to the relief operations headed by the foundations of the country’s top television networks GMA and ABS-CBN. 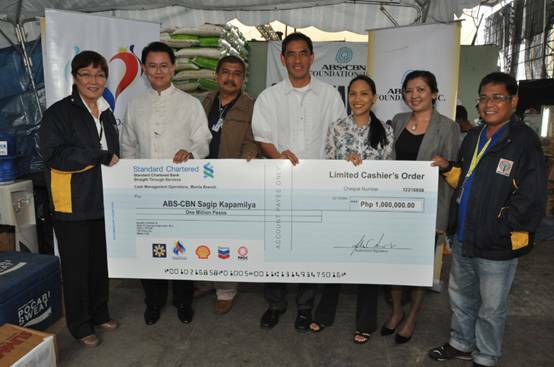 The cheque handover was held August 14 at the ABS-CBN and GMA Network offices, and was attended by Malampaya Foundation Executive Director Karen Agabin, Chevron Asset Manager Sabino Santos, Shell Philippines Exploration BV Finance Director Jeng Pascual, as well as representatives from both networks and their respective foundations. Devastating floods brought on by torrential monsoon rains left close to a hundred people dead and affected about 2.4 million people in the Philippine capital and its nearby provinces. Relief efforts are now focused on the over 360,000 men, women and children who are being temporarily sheltered in government-run evacuation centers. Established in 2006, Malampaya Foundation is the social investment arm of the Malampaya Deepwater Gas-to-Power Project, the largest and most significant foreign investment and infrastructure project in Philippine history. 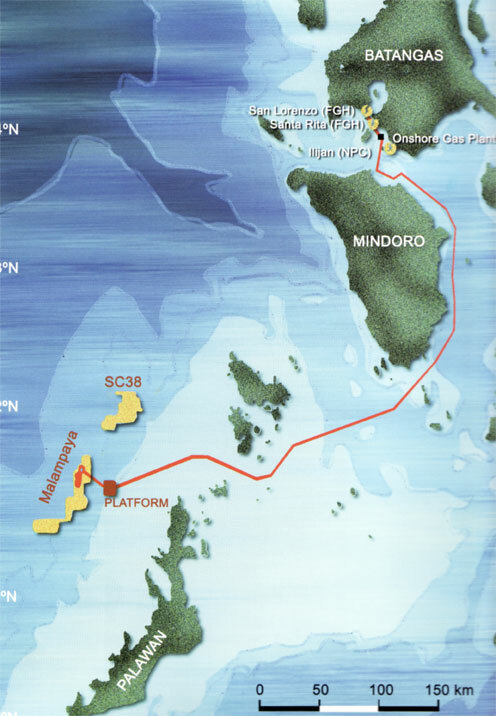 The Malampaya Deepwater Gas-to-Power Project Joint Venture (JV) Partners, is composed of Shell Philippines Exploration, Chevron Malampaya and the Philippine National Oil Company – Exploration Corporation. Malampaya provides fuel for 40-45% of Luzon’s power generation requirements through cleaner-burning and indigenous natural gas, and benefits the country by reducing oil imports and providing a safe, reliable and cleaner supply of energy. The JV Partners are united in the effort to assist our countrymen who were severely affected by the massive floods brought about by the continuous rains. 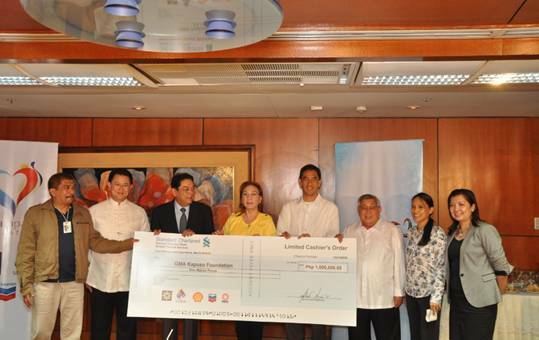 During the cheque handover to ABS-CBN Sagip Kapamilya and GMA Kapuso Foundation, Malampaya Foundation Executive Director Karen Agabin said, “We hope that Malampaya’s assistance will go a long way in helping our countrymen to recover from the calamity and rebuild their lives.” The funds donated by Malampaya Foundation will go to helping the flood victims who are in need of food, water, clothing and medicine. Malampaya Foundation, Inc., the social investment arm of the Malampaya Deepwater Gas-to-Power Project Joint Venture, donates Php 1 million pesos to ABS-CBN Sagip Kapamilya, represented by its Program Director Tina Monzon Palma (left most) and Deputy Director Marcel Riñon (right most), in support of relief and rehabilitation efforts for flood victims. Also in the photo are (left to right) Shell Philippines Exploration BV Finance Director Jeng Pascual, Malampaya Foundation, Inc. Finance and Administrative Manager Ronald Bustos, Chevron Malampaya LLC Asset Manager Sabino Santos, Malampaya Foundation, Inc. Executive Director Karen Agabin, and Chevron Communications Specialist Gigie Rebulanan. Malampaya Foundation, Inc., the social investment arm of the Malampaya Deepwater Gas-to-Power Project Joint Venture, donates a cheque of Php 1 million to GMA Kapuso Foundation, represented by GMA Network President and COO Gilberto R. Duavit (3rd from left), GMA Kapuso Foundation Executive Vice President Mel Tiangco (4th from left) and GMA Network Chairman and CEO Atty. Felipe Gozon (3rd from right) in support of relief and rehabilitation efforts for flood victims. Also in photo are (left to right) Malampaya Foundation, Inc. Finance and Administrative Manager Ronald Bustos, Shell Philippines Exploration BV Finance Director Jeng Pascual, Chevron Malampaya LLC Asset Manager Sabino Santos, Malampaya Foundation, Inc. Executive Director Karen Agabin, and Chevron Communications Specialist Gigie Rebulanan.